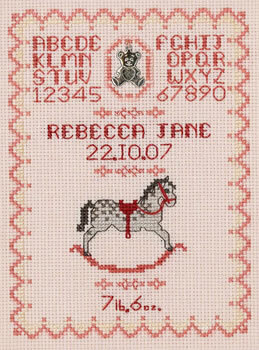 An ABC Pink Birth sampler cross stitch kit for a new birth in pretty pinks and aqua shades. A delicate trellis border contains an alphabet. Other motifs include a duck, doll, abacus with coloured beads, rocking horse and rattle with a pink bow attached. There is space to add names and birth weight using the alphabet provided. 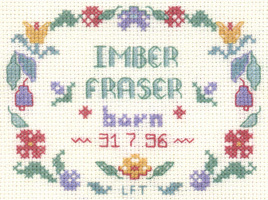 ABC Pink Birth Sampler cross stitch kit for a new birth in pretty pinks and aqua shades. A delicate trellis border contains an alphabet. Other motifs include a duck, doll, abacus with coloured beads, rocking horse and rattle with a pink bow attached. 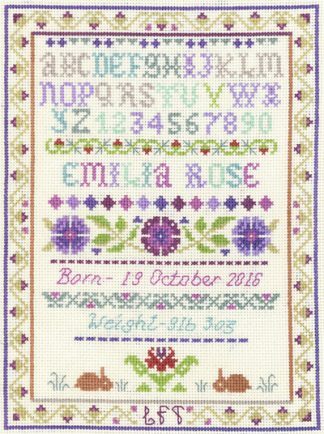 This ABC Pink Birth sampler cross stitch kit has only the best quality materials ~ Zweigart fabric, DMC thread, metallic threads, Mill Hill beads, needles. A full alphabet is provided to include the names and birth weight. This ABC Pink Birth Sampler is from the Decorative Textiles collection.